What should I wear to my sisters/brothers wedding? How do I look the best at my sisters/brothers wedding? What colour lehengas would make me look the most different at my sister/brothers wedding? Who are the best designers for sister of the bride/groom outfits in India? Well, I have been looking through outfits and designers for some time now, and I have three designers whose outfits I want to share with you all. They are fresh, somewhat new names and their designs are totally hatke. You will love them for sure. She is all over the internet these days. From Pinterest to Instagram and Facebook, this designers outfits keep popping up on my screen. Every outfit from her collection is such a stunner piece. It doesn’t help that the photoshoot done for every single lehenga is the same. Its super duper confusing to choose the favourites. If you are someone who knows exactly what colour combination, what kind of design and work you want on your lehenga, then Swati Manish is the goto person for your outfit. She has a zillion combinations of drop dead gorgeous lehengas that you can wear to your brothers or sisters wedding. If you had to ask me, my favourite from her collection is the ombre shaded lehengas. They look so stunning, such meetha colours you instantly fall in love. These are totally in this season, pastels are all over the place…and they are quite reusable as well. Swati Manish Lehengas are perfect to wear in a day function like mehendi, or sangeet. Her lehengas have a nice flare and the gorgeous border would look amazing on the dance floor when you twirl with your girl gang. Anywhere between 50k to 1 lakh. These are some of the outfits whose prices I could dig up. But you can check with the designer for customisation and price options to fit your budget. I have become such a fan of Jayanti Reddy outfits ever since Disha Patani walked the ramp for her in Lakme Fashion Week 2017. I started browsing through pages and pages of Jayanti Reddy outfits, and there is no looking back since. Modern to its taste, her lehengas are traditional yet fun and playful in its look. Whether you are a bride or a sister to the bride or groom, you will find loads of bookmark worthy outfits from her collection. I shared one of her lehengas on my Frugal2Fab Instagram handle, and I got the maximum number of questions about the outfit. Who is the designer, where can we buy it from, how much does it cost and so on? So I thought let’s just address the issue. Perfect mehendi looks, her designs are classics. Not too much going on, more focussed on the colours rather than making the lehenga look too heavy. I think her brides look totally radiant in her designs, and seem to be so carefree and bindaas. If you are looking for a fuss-free lehenga outfit, then Jayanti Reddy should be your pick. 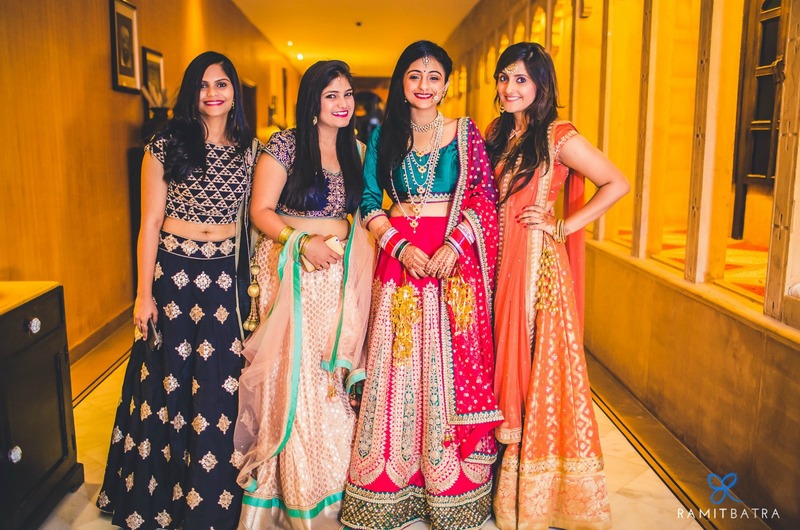 As a bride or grooms sister, you should wear a Jayanti Reddy Lehenga because her designs are young, fresh and the focus will still be one you rather than the lehenga stealing your limelight. Her lehengas range anywhere between 70k all the way to 1.5 lakhs. Jayanti Reddy is a Hyderabad based designer and you can buy her outfits online on Ogaan, Aashni & Co., & Elan. Varuna Jithesh is a new find for me. Usually, its so difficult to locate a designer who fits the budget, and has options in all price ranges. If you are a budget bride to be or a budget bride/groom’s sister then you are going to love her collection. The good part is that all her outfits are available online on her website, and you can check out the prices and know about the design, material and everything about the lehenga look. I am sharing some of my top favourites here.